Cuban exile and accused terrorist Luis Posada Carriles is back in the news. Posada is the admitted mastermind behind the bombing of a Cubana Airlines jet, which killed 73 people in a midair explosion over Barbados on Oct. 6, 1976. U.S. plans to deport Posada have gone awry. At least seven countries — Canada, Mexico, Panama, Costa Rica, Guatemala, Honduras and El Salvador — have refused to take him. At the same time, the Bush administration has refused to honor Venezuela’s request for Posada’s extradition to stand trial there. Posada is a Venezuelan citizen. In 1985, he escaped from a Venezuelan jail (with CIA help) while standing trial for the airliner bombing. On Sept. 11, an immigration judge ruled Posada be released unless the administration charges him with terrorism. In a Justice Department brief, the Bush administration admitted that Posada is “an unrepentant criminal and admitted mastermind of terrorist plots and attacks on tourist sites,” but refuses to charge him for such crimes. The Bush administration’s handling of this case has resulted in a firestorm of criticism and charges of hypocrisy. “The fight against terrorism cannot be fought à la carte,” said José Pertierra, a Washington lawyer who is representing the government of Venezuela in its effort to extradite Posada. “A terrorist is a terrorist,” he told The New York Times. The hypocritical stand is only part of the problem the Bush administration faces. Posada worked for the CIA as a demolitions expert, saboteur and plotter of violent crimes. He helped organize well over 100 murderous attacks throughout Latin America and the United States. He was involved in Contra operations in Nicaragua, hotel bombings in Havana in 1997, and an assassination attempt against Cuban President Fidel Castro in 2000. And according to newly released documents from National Security Archives, Posada told the CIA that he and other exile cohorts like Orlando Bosch (who freely walks the streets of Miami) were planning to bomb the plane. Cuba’s National Assembly President Ricardo Alarcon said the Bush administration has a self-interest in covering up the case and declassified information. “The Bush administration wants to avoid a trial at all costs because someone will ask about the role of the CIA, and its director in 1976 was George Bush Sr.,” said Alarcon. • Information tying the FBI to one of the airliner bombers. • Then-Secretary of State Henry Kissinger was briefed on¡ previous failed attempts to bomb flights from Panama and Jamaica to Cuba. • The bomb was placed in a Colgate toothpaste tube. Jesus Rojo, a Cuban father of three, was one of the 73 passengers, along with the entire Cuban Olympic Fencing team, other Cubans, Guyanese and North Koreans. 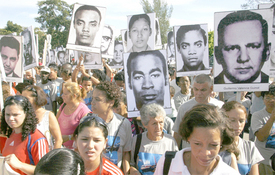 His youngest son Camilo is the coordinator of a committee of victims’ relatives seeking justice. “I am not seeking vengeance; what I want is to see Posada in court,” Camilo Rojo said. Terrie Albano contributed to this story.